My dad’s family, the Woods, come from a coal-mining village just outside of Birmingham – a little place called Baddesley Ensor. My great great grandad Thomas was born there in 1813, and grew up with his surviving sister and seven brothers (4 died as babies). As was the way of things then, the boys went down the mine, and some stayed their whole lives. But Thomas got out of the mine and set up as a butcher. 1866 Feb 22 Bought of Mr Wilson’s 5 Fat Wheather sheep, 1 sheep 2.7.0; 4 [ditto] 3.2.0 a piece, I think they are worth their cost. March 9 Slaughtered a fat calf for Mr I Baldocks, price 3.0.0. Not a bad bargain. Mr Baldock feeds his calves well. 1877 Nov 6 Paid Mr Wilson for nine fat sheep 24.15.0. Although these entries can become boring (as so much accounting can be), reading them with a different eye reveals what the business actually involved and how he ran it: he drew stock from a radius of about 4 miles both at markets and from specific farmers. Four miles is about a half-hour’s ride, and close enough to be able to walk the stock back to the shop within 1 & 1/2 or 2 hours. He typically bought one cow/bullock or a ‘fat pig’ or 3 sheep every 2-3 days, and slaughtered, butchered and sold them while still fresh. Before refrigeration this time cycle was crucial. Sometimes Thomas would buy a small herd from a farmer, with the deal of being able to draw off the stock from the farmer’s paddock within a fortnight or so. He could then just send one of the children every couple of days to pick up another animal and drove it back. Thomas also kept pigs and regularly slaughtered the piglets and occasionally full-grown pigs. And he bought in tubs of butter and big sacks of flour, which he would re-sell in the shop for a good margin. Sometimes there was even stock for free: Every late summer for days on end when the fish were running he and at least one of the children would go fishing in nearby streams and holes, coming back with catches of 5-20lbs which would also be processed and sold. Thomas and his wife Ann had 12 children, 5 girls and 7 boys, all of whom lived to adulthood (a sign of increasing affluence). It’s clear from the diary the children were integral to the business operation from early teen-hood, though only some of them showed definite interest. These latter started writing in the diary, at first just comments but as time went by duplicating Thomas’ recording of business activities. Thomas’ six brothers also feature often, since they were all living in the village within a stone’s throw. One of his brothers actually died in Thomas’ living room, and he vividly records the shock and drama of this. 1884 Jany 6 My dear father fell asleep in Jesus after a long illness he died triumphantly over death. Very happy. There’s no account about how Thomas got going in business, but my bet is that he just started. It wouldn’t surprise me also if Thomas started in the backyard where he lived. The village was at that time a string of cottages fronting the road and backing onto fields. Space was just there. He learned his trade as an adult; the 1841 census has him age 27 as a coal miner living with his in-laws, his wife and three young children. So somewhere there was a deliberate plan to change focus, though almost certainly he learned his trade locally, perhaps from a nearby butcher or farmer, perhaps even a relative since the Woods were thick on the ground in that village. And if he was competent and built a reputation for fair value, freshness, and pleasant company then his success was assured. Speaking of relatives, it’s also clear that Thomas’ business went on very much in the community. His seven siblings are always dropping in, he clearly relies on particular farmers for supplies, sometimes over decades, as is true of many customers also. And his eleven children are incorporated into the operation as soon as was practical. Almost all the children ended up emigrating to New Zealand as young adults (that’s how I come from Australia), but because there were so many of them the youngest were still at home and working in the business when Thomas died aged 71. There’s a great richness in serving one’s community in such a practical way for so many decades. The embedment in community means one’s relationships both with suppliers and customers simply flow because they follow a familiar pattern. Trust is continually created and affirmed. And the continuity of unspectacular but steady money over a long period – the original basis of middle class wealth – also results in material ease. Thomas was able to sustain his activity supported by family, church (he was devout), community and the fertile English land. The question for many of us these days is different and more complex because our choices are at once far broader and far more constrained. For example Thomas’s business was simply supplying an already well-recognised product without any agenda around spiritual innovation or social change. For me, what is sustainable in the long term is very much about what feeds my soul, what is on my path, what resonates deeply with me and gives expression to those depths. Our simultaneously broad-and-narrow range of choices with our desires for innovation and change makes this immensely tricky. But alongside this there remains the very human and very fulfilling satisfaction, which we can share with even Thomas’s generation, of being recognised and valued in one’s community. It’s very clear that money is entirely a cultural construct – it’s something that is created by society, it has no material reality in itself, and no natural or external force caused its existence. There is an incredible freedom in this. It means we don’t have to be run by our culture’s familiar emotions of fear, greed, shame and anxiety – these are just emotions attached to cultural stories, which don’t give us useful or accurate information about money itself. Instead, we can create our own relationship with money. Rather than simply be constrained in the tight space generated by those familiar cultural emotions, we can come to find meanings of money which resonate with us at a deep level and which help us become more and more aligned with our authenticity and our spiritual path. The range of possible meanings is endless. All meanings are valid – though the most useful are those which bring us into a constructive and enlivening relationship with money. As a start to this process of creative refreshment, here’s some images or archetypes that I am working with and find stimulating. A previous post talks about this in more detail, but the essence is this: Many people who bring a gift to the world are bringing something new – something which the world is calling for because it does not yet exist. Because our gift does not yet exist it is often hard to tell people what we offer. In such a situation it is helpful to see ourselves as a bridge – between what we know is good but is not yet manifest, and the current reality of social life. A bridge has the extraordinary property of being anchored in 2 places at once. In our case our strong connection with our gift usually means one end of the bridge is firmly anchored in what we know is possible. It is often very challenging, though, to get the other end of the bridge as solidly anchored in current social life – it’s hard to clearly say what our gift is and to connect with the people who want it. But when we are able to make that solid connection to current social reality then people can easily hear and see what we offer, and they can readily feel whether it is for them or not. And as a result energy can flow both ways: we get to offer our gift regularly and often. It is well received. And money can flow easily. In this scenario, then, money is a litmus test of how good a job we are doing of being that bridge – how solidly we are anchored both in the current world and in what is possible. Our fears about money tempt us to look outside ourselves for solutions: need to get a job, generate more clients, find a patron, work more hours, win that contract, be more focused. All are action-oriented. So what if we turn that around and ask about not-doing? What if I grabbed the emotional energy motivating those actions and brought it inwards? What would that look like? It might look like standing very still but very solid. Solidly anchored in one’s own space, one’s body. Feeling the connection through feet to the ground, and from the ground up one’s legs and suffusing throughout one’s body. Feeling the move and sway of Earth energy, like the sinuous movement of a giant beanstalk, or the elastic wind-swept movements of the branches of the trees. Feeling one’s energy coalescing absolutely at one’s centre, deep in the belly, allowing firm rootedness to the Earth below and at the same time fluid adaptive movements in my pelvis and all my limbs as I respond to Life’s events. Debt mostly gets a bad rap in our society : being in debt is seen as bad, as a burden, being ‘trapped’ by debt, a constant source of anxiety. Credit cards are frequently seen as actively dangerous and credit providers as malevolent. Government deficits are seen as irresponsible. At one level all these things can be true. But we don’t have to relate to debt in that way. Especially if we are borrowing money to fund a business which expresses our life path, we can see that act of borrowing as an expression of faith in our gift and in our path. If we did not believe that our gift is needed and that we have the capacity to give it, then what are we doing in business? Come to that, what are we doing at all? This doesn’t mean we should just gaily launch out into debt willy-nilly. We are a bridge between what we know is possible and what is currently happening in our society. So it’s crucial that we are wise and sure-footed about bringing our gift to the world as-it-is: we need plans grounded in the realities of the world and in what our own capacities are and what they are not. But such plans do not have to be gloomy or restrictive. Nor does borrowing have to be a constant and unrelieved burden. Rather, we can see borrowing money as a very tangible expression of our faith in our gift: that our gift is true, that the time is right for it, that we can offer it well, and that we are willing to serve our gift in whatever way it needs, including taking risks. These three suggestions are just a start – a stimulus for creativity around our relationship with money. What works for you? Most of us in the West are socialised into a permanently conflict-ridden relationship with money, in which we often feel trapped by our conflicting emotions. But beyond that narrow space limited by our habitual emotions is a whole world where other things happen. The fear of not being able to pay our debts looms large in the Western psyche. The English-speaking world has its legacy of slums, debtors prisons and workhouses horrifyingly described by Dickens and others. But late nineteenth century liberal responses to these horrors changed bankruptcy from a very public shaming for moral turpitude to a benign legal and administrative device to forgive debts and allow the debtor a fresh start. Like no-fault divorce, the attitude behind bankruptcy legislation is that things don’t always work out well despite people’s best intentions, and the wisest attitude is simply to set people free with no blame to start again. Certainly most people who go bankrupt feel a great deal of shame, guilt, remorse and fear. And credit agencies, friends, colleagues and family often subtly reinforce these feelings in subsequent years. Bankruptcy is not a small step. But the point is that there is life beyond “going bankrupt”. It’s not the end of the world. It’s simply the end of one phase of life and the start of another phase of life, another type of life, another style of life. Two friends who have been through bankruptcy, both men, say that going through the process forced them to confront and dismantle their unconscious attachment to being a breadwinner, a ‘successful businessman’ and indeed their attachment to a narrow form of masculinity. At the emotional/psychic level, for each of them their bankruptcy was an ordeal by fire – as we would expect given our tortuously conflicting emotions about money. But each is now more free, with a richer and more autonomous sense of self. And – they are free of debt. Gracely shows us that beyond what most of us consider to be a total catastrophe, the end of “life as we know it”, is a whole world – certainly a very different life, but still a life. Being homeless is not necessarily a desirable goal, or necessarily an easy way of life. But the point is that there is life beyond our fear or shame about not having a home. And especially that there can be more dignity in being homeless than staying in an immoral or soul-destroying situation. The above two stories of disruption seem to support the cultural story that there is not enough money to go around – that we have to battle to make ends meet . But despite our culture of fear and tightness around money (or because of it? ), there is a very well-established pattern of people having money – huge amounts of money – thrown at them. The apocryphal example is JK Rowling. Here is a single mum telling bedtime stories to her kids, and people start throwing hundreds of millions of pounds at her – all for telling stories that apparently hit the spot for millions of people. The phenomenon of celebrity is based in this: people can become famous, with the associated wealth, simply because they hold something on behalf of millions of people – often something quite ephemeral like a personality trait or a story line. JK Rowling’s experience disrupts the story there is not enough money, or that it’s hard to come by. This makes it clear “not enough and work hard” is just a story – actually, one of our culture’s foundational stories about money. Believe any of our culture’s money stories are true and you can find support for them everywhere. This is how culture works. And also, like all our stories about money, there is a whole world beyond it. Money brings up strong emotions for most people. Talk about money for any length of time raises feelings of fear, greed, envy, anxiety, and of lack or “not enough”. Are these feelings just inevitable around money? Definitely not! Clearly, he lives in a culture which simply does not equate money with survival or with obtaining food. His experience of the world is that food is just there – even if it’s in garbage cans. He does not link lack of money with lack of food: if he lacks money then food is still always available – it’s just in very grubby or inconvenient places. But in the West one of the most common emotions raised by money is a gut-level fear about survival: for most people money is a life-or-death issue. The young Paraguayan man makes it clear that this gut-wrenching fear is not about money itself. Rather, the fear is an emotion which we have learned to associate with money. We learn this as children, along with many other ‘basic’ things about life in Western society. This linking of survival fears with money is a cultural attitude – it’s not only something we feel as individuals. We share this feeling with millions of other people in our culture. Gut-level fear around money ties in with where money comes from. Privately owned banks are licensed by the government to simply create money by entering numbers into their accounting system when someone takes out a new loan.That wouldn’t be a problem if all the borrower had to do was repay the money. But banks charge interest, and this interest has to be paid from the existing pool of money – so that there is never enough money to go around. In other words our society’s supply of money manufactures a situation in which those who have it are obligated to repay it with money which doesn’t exist. In this situation, like in the game of musical chairs, someone has to lose. Understandably, then, a very widespread attitude throughout our culture is of “not enough” in relation to money. This attitude is very easy to attach to gut-level survival fears – giving rise to emotions like anxiety, panic, jealousy, competitiveness, hoarding compulsion, greed, and so on. Alongside this vicious game of musical chairs, Western culture is pervaded by an astonishing schizophrenic split around money. On the one hand money is the worst thing in the world: “Money is the root of all evil.” Get that: “all” evil! And the Bible teaches us that money is inherently un-godly: “Ye cannot serve God and Mammon” (Matthew 6:24) – as though serving “Mammon” i.e. material existence, is diametrically opposed to serving God. On the other hand our enculturation into the money-and-survival gut-level feelings tell us that money is central to existence. Our feelings here are supported by the news and by politicians: almost all high-profile public debate revolves about money. The common measures of a country’s condition are economic, while fluctuations in the stock market generate widespread emotions of optimism or gloom. So we live in a culture which sees money as (a) immoral and not spiritual, (b) vital for existence, and (c) not enough to go around. This is our Western culture – the emotional soup in which we live our daily lives. Is it any wonder that we have “stuff” about money!? The good news is that there is no actual physical reality about money – it is purely a cultural creation, a mechanism legislated into existence, which our young Paraguayan speaker above clearly illustrates. This means that we can come into our own relationship with money. Money certainly has a material presence in our culture, and so there is a level at which we have to practically engage with it, like following the road rules to avoid being run over, or using toilets to reduce disease and odour. But we don’t have to accept the significance of money which we were socialised into as children and which pervades the social world around us, in the media, and in the attitudes of people we commonly interact with. We can recognise this material presence and weave it in to our lives via meanings we create ourselves and via emotions we choose to generate. We can do this by coming into a conscious relationship with the money-related emotions we are familiar with – as with any personal growth process, a first step is to be able to recognise and name our internal patterns. Through consciousness-raising – i.e. new perspectives like the content of this blog, more accurate information, and reviewing our own experiences in the light of this new data – we can come to recognise the extent to which we have learned our familiar money emotions, and that those emotions are culturally supported by those around us and are not actually giving us accurate information about money itself. And we can intentionally open ourselves to many resources, both internal and external, to seed the creation of our own stories about money, our own relationship(s) with money, our own meanings and our own patterns of action and emotion around money. There’s many possibilities as to what our new stories and new emotions might be. Some stories already circulating revolve around themes of “abundance” attitudes, prosperity consciousness, empowerment (my own favourite), the Occupy movement, and living without money. We can find our own relation with these – or make up more! The vital step is coming to recognise our culture’s familiar emotions about money – and to realise they don’t have to be ours own personal emotions. For many people who are committed to spiritual growth, a major question is how to combine spiritual path with generating an income. This is often a tricky area because many people who seek to integrate path and income also seek to bring something new into the world. So, almost by definition, what we seek to bring into the world is not widely recognised as valuable or useful – otherwise it would already be in existence! It’s easy to go into despair about money and our spiritual path – or go into anger and resentment. These two common emotional responses keep us focused on money as a stumbling block. But what if our struggles around money are trying to tell us about something else? I think of us ‘spiritual activists’ as being a bridge between social life as it is now, and another reality where beauty, love and similar non-material forces hold sway. Our work is to bridge those two worlds, and to bring more of love and beauty into current social life. Bridges have the extraordinary quality of being anchored in two places at once. Each end of the bridge rests solidly on the ground in each place – these resting points are called the abutments. 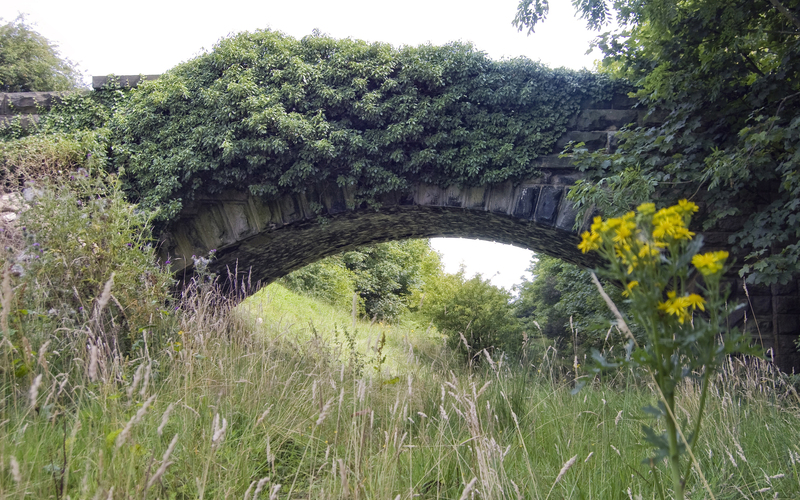 Without both abutments, the bridge is not actually useful – it doesn’t stand and doesn’t do its job of being the passageway from one place to the other. It ends up looking like this bridge: well-anchored at one end, but it leads people straight into the water. Both abutments have to be present. One abutment anchors the bridge in the spiritual world – the world-yet-to-be. This anchor emerges from our knowing that our gift is right and true – and for those of us active in our paths this anchor is usually very solid and vivid. The other abutment anchors the bridge in the social here-and-now, in existing social arrangements and conventions: the language we use to communicate about our gift, and the structural and organisational things we have in place which allow people to come into relation with our gift. When these concrete things are solidly in place then people’s energy can flow from the existing social world across towards the yet-to-be and help to bring it into being – including financially supporting us to be that bridge. In this picture money is like a glue that sticks our bridge solidly onto the ‘society’ abutment. Without money then the bridge just sits there by chance – it stays only so long as everything else is stable, only as long as our life circumstances allow us to give our gift for free. Without the glue of money, life’s normal circumstances can disrupt the bridge: changes our relationships, our health, our community, our home. This analogy suggests that money is a result of us being very grounded in society as it is. So problems with money can prompt us to look at how we are engaging with existing society. Even though we may believe we are doing our best around integrating money with our path, society is so various – so multi-faceted – that there are always other ways to engage with it. where we are looking for the people? Because we’re offering something new, our potential clients are seldom clustered into established demographics or familiar marketing groupings. It’s likely we’ll need to contact people through groups which have a different-but-related interest. For instance a tantra practitioner has a profile in the nudist community and picks up people who want to go deeper than just physical nakedness. Part of my target market is healers and therapists – people who recognise and value presence and deep communication. What form are we offering our gift in? We might offer one-to-one sessions, or weekend workshops. Or we might deliver classroom programs. Or write a column. Or consult to organisations. We might do several of these things. Often the form we offer is driven by our own ideas about our gift, what sort of lifestyle we want, what we believe our strengths and weaknesses are, and so. All these are valid considerations. And also we can ask: what form(s) might work well for those we want to reach? Maybe introductory talks are what’s needed. Maybe a book is important. Doing things differently to how we’ve done them is very challenging. The areas I’ve discussed above are generally called “publicity”, “advertising” and “marketing” – for many people very confronting to get involved in. Yet if our priority truly is our path and not protecting our ‘small’ self then when we engage with challenges amazing resources emerge to help us on our path. We don’t have to frame these challenges as advertising or marketing – labels which keep us thinking in conventional social terms. We can think of our activities in these areas as enhancing our capacity to be that bridge – by learning to reach across and anchor ourselves even more firmly in the social here-and-now. In the Accountant’s Cycle of the Seasons, there’s four distinct seasons. 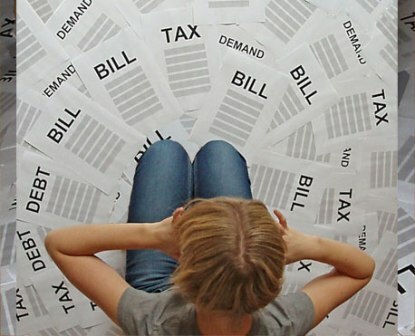 The hottest is the long 4 months from October til 31 January – the Tax Season, when many people not fortunate enough to have a loving relationship with their accountant become gibbering wrecks, haunted by the ghastly spectre of the Tax Man. The Tax Season can be capricious: an apparently comfortable situation can suddenly be devastated by a looming tax bill. Or the gloom of a huge tax burden can suddenly evaporate when the error in the spreadsheet is located. … until about now, when once again the Tax Season is upon us, and the cycle starts all again. I think these quotes don’t actually talk about money itself. Rather, they reflect one aspect of the very schizophrenic attitude that the West has towards money. On the one hand money is inherently bad and as far away from ‘spiritual’ as you can get. On the other hand money is the main measure of social success and progress (think GDP and economic ‘growth’), the issue discussed most often in the news, the top issue in every election, and something we need even before we can have food. In other words our Western attitude to money is that it is at once centrally important and morally unacceptable. A sure recipe for psychosis and neurosis of all sorts. No wonder people associate money with ‘obscenities’ and ‘evil’! But those qualities are not in money itself – they are just in our attitudes towards it. Many of us on the spiritual path seek to generate our income by doing work which is fully aligned with our values. Some go out on our own as freelancers or set up a business that offers what we feel is our unique gift to the world, or gives expression to our reason for being. Through my own path around this, and working with clients who are on a similar path, I’m starting to see that, in addition to the mundane material aspect of paying the bills, there’s another deeper dimension to our relationship with money. 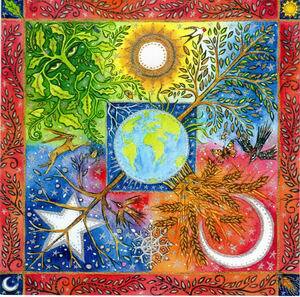 As spiritual beings who want to bring spirit to our ‘work’, the implicit belief here is that we are each here for a reason, that we each bring a unique gift into the world, and our ‘work’, our job, is to make that gift manifest – to bring it into concrete reality and offer it to the world. The old way to do this assumed a split. Either you do your spiritual work for nothing i.e. you offer your services voluntarily (“if I’m doing it for love, how can I charge for it?”) and you struggle (the artist in the garret). Or you disconnect work and spirit, live a venal life during the week (pursue profit), and confine your spirit to church on Sundays. Our challenge these days is to resolve that split. Our challenge is to meet the world as it is now – as it ACTUALLY is in all its material reality, with all its problems and faults and foibles and cruelty and destruction. Indeed it is often the existence of all these horrible things which calls forth our unique gift. Many people feel called to address difficult issues, to repair or heal things, to open up new spaces, to lead new freedoms. 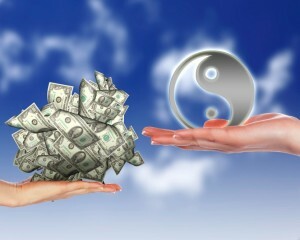 It is here that money can be a very concrete litmus test of our spiritual alignment. When we are deeply in alignment with our ‘purpose’ or our calling, when we are offering our unique gift with all our heart, when we are truly in the flow, then there is the experience that everything flows – love, pleasure, creativity, friends, the right contacts, and so on. Since money is actually a part of the world, part of this flow will take the form of money. In other words when we are in the flow, money flows easily, like everything else flows easily. This is not to say, as in “The Secret”‘s Law of Attraction, that money is the only thing that flows, nor that it is the most important thing that flows. When money is flowing easily this is a sure sign that we are beneficially aligned with our society at a very material level. But this is only the material level – it is possible to be immensely wealthy without having a single spiritual bone in one’s body, so to speak. But when at the same time we also feel carried by the flow of spirit then the easy flow of money denotes something really special: that we are artfully dancing the balance between spirit and the material – that we are for the moment finding a way to manifest our unique gift, our contribution to the world, in all aspects at once. So the aspiration to have a profitable business and to have plenty of money can be a profoundly spiritual goal. In itself the goal of money is flat – only material. But when harnessed with spirit, a strong flow of money is a sure sign that we are not only in alignment with our path but also that we are making our gift available in a very tangible practical form that is recognised by others and accessible to them. Not only are we being true to ourselves, but also others recognise and value our gift – and express that value through giving us money. Which means we are making that gift manifest in the world beyond merely our own fulfillment. In this way, then, money can be seen as a litmus test of a really thorough and grounded spiritual alignment.